A three day Soft Skill Workshop for Sashastra Seema Bal (SSB) personnel was inaugurated by Shri Kuldiep Singh IPS Inspector General Siliguri Frontier Sashastra Seema Bal at Adhoc Training Centre at Falakata on 4 Feb 15. While speaking to the 50 jawans belonging to 17th Bn Falakata and 53rd Simlabari he said that people have uncalled fear of Police personnel. SSB jawans should make sure we conduct ourselves with a humane approach in a sober and decent manner. He advised the Jawans to remember always that SSB is here to strengthen Indo Bhutan and Indo Nepal relations. He enthused the personnel to consider this ‘Pilot Project of SSB’ as a dream project and pursue their work as guardians of the Force. Also present on the occasion were, Shri J K Sharma Consul General of India, Bhutan and Shri Bishwadeep Dey Deputy Chief of Mission of India, Bhutan, Shri H S Gaday DIG, SSB Jalpaiguri Sector Headquarter, Commandants of 17th and 53rd Battalions, Area Organizers and state government officials. Shri J K Sharma Consul General of India said that he was posted in Phuntsoling for the last two years and has never heard any complaint against the behavior of SSB personnel. He acknowledged that SSB was doing a decent job while discharging their duties on Indo Bhutan border and was enriching the relationship too. Shri B D Sharma Director General, SSB felt that SSB always had a ‘people friendly’ image and that it was getting corroded by years of assertive Border Guarding responsibilities of SSB Jawans. Hence, he ordered that the battalion personnel be put through a Course in which the personnel would refresh their soft skills, gain exposure and understand the importance of this age old relations between Indo-Nepal and Indo-Bhutan. They should be taught the skills of checking and frisking without offending the guests. Any rough rude behavior could have detrimental consequence to the image of the Force and the international relations too, which is unacceptable. DG desired that initially two interaction teams comprising one Sub Inspector/ ASI, one Head Const/ GD, three Const/ GD and one CT/ GD (Mahila) be formed and deployed at SSB’s Panitanki Out Post in Darjeeling District and at Jaigaon Out Post in Jalpaiguri district, after the workshop. Personnel in these teams will wear civil uniform with SSB badges/ logo and will engage in interacting, checking and frisking on need basis in the above mentioned border Out Post. Yet, another programme was inaugurated by Shri Shakeel Ahmed, IPS, DIG State Intelligence Bureau at Ranidanga Campus of Siliguri Frontier on 4 Feb 15. Shri Shakeel Ahmed in a matter of fact way said that a uniformed guard is not very effective at all the times on a friendly border as the uniform changes the personality and behavior of the personnel. Special conversational skills, etiquette and presentation make a lot of difference. Even a stressful situation can be handled politely. These skills also help in singling out an enemy or infiltrator while discharging ones duty at the friendly borders. Shri A. K. Mallik, DIG, Sector Ranidanga welcomed the Chief Guest and explained the aims and objectives of the workshop. 48 personnel were handpicked from different battalions under Ranidanga Sector to undergo the training. To train these SSB personnel, resource persons from the Bureau of Imigration, Customs, Narcotics Control Bureau, NGO’s operating along international border on soft skill development and learn basic Nepali language. 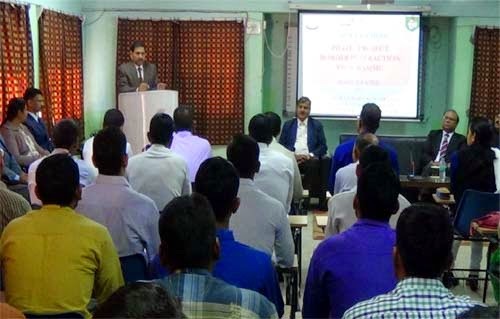 The trainees will refresh their knowledge about immigration procedures, powers and functions of SSB, various rules and laws inconnection with trade and transit movement of third country nationals, FICN, Narcotics, Human Trafficking related profiling and work in close cooperation with sister agencies and NGOs of the border, Shri Mallik added. Shri Kiran Rizal Staff Officer (Ops & Int) gave a brief outline of the three days workshop. Present on the occasion were Shri S. K. Sarangi, SO(Admn), Siliguri Frontier, Shri S. K. Dhar, Commmandant (AJAG), Shri Sudhir Verma, Commandant 41st Bn Ranidanga, Smt Leena Gupta Area Organiser, SSB Kisanganj Area and other Officers.